Mid-February 2018 Check-in – Nigorimasen! 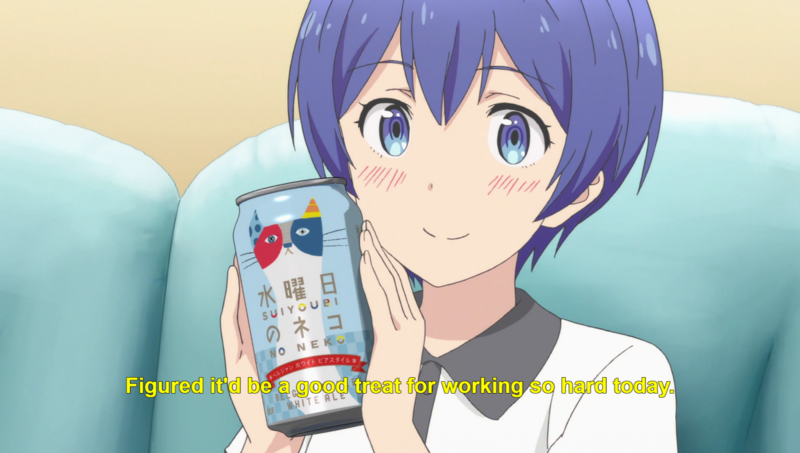 Michiru holding a can of “Wednesday cat” beer in Takunomi. I’m back with a few thoughts on new anime series and some other things. I also rewatched Sayonara Zetsubou Sensei with some friends. I had forgotten how long some of the “I’m in despair!” extrapolations are strung along in certain episodes. In the realm of live-action movies, I saw Justice League in a discount movie theater and liked it. It was my first exposure to the newest batch of DC Comics films. (I think the last DC Comics-inspired movie I saw was Superman Returns from 2006.) The story seemed to move at a good pace. It was more sullen than the Marvel feature films I’ve seen, but maybe that mood is expected since the villain is an alien commander trying to transform Earth into a hellscape for himself and his bug-like minions. Lastly, I plan to start writing again on Sport in Fiction, a side project of mine. I am considering starting a Patreon and soliciting contributors (who would be compensated for their work), but that might be a few months off since I would first like to establish a reliable schedule. I have been blogging about anime for more than a decade. My other interests include sports, business & legal affairs, and philosophy. Tagged Anime, Girls' Last Tour, Justice League, Karakai Jozu no Takagi-san, Laid-Back Camp, Movies, Pop Team Epic, Sayonara Zetsubou Sensei, Takunomi, Weekly Check-In. Should I Kiss Your “Bubu”? August 2018 Check-in – Going back to school – Nigorimasen! on Crunchyroll Expo 2017 was everyone’s first Crunchyroll convention. Lauren Orsini on Goodbye, 2017!